Our range of products include litchi / lychee juice bottle manufacturing machine and plastic blow moulding machine for medicine bottles. Output Of Hdpe (Kilogram per Hour) 30~35 kg/hr. Model: be_h2000 ds/4h deflashing. Capacity: 200ml~2000ml. Brand: BLOWENGG Weight: 2 Ton. 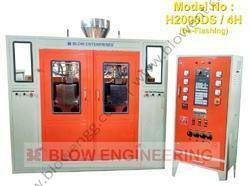 Being a quality oriented organization; we are involved in offering Auto Deflashing Blow Moulding Machine. Designed with utmost precision; the provided machine is used in various industries for blowing and moulding plastic and material in different shapes. Customers can avail these in various capacities.